Jack Hargreaves was born on 31st December, 1911, in north London and was brought up on a farm near Aylesbury. He spent much of his working life in London but from the late Forties combined this with firstly a caravan on the banks of the river Kennet and then a cottage by the river Lambourn. In later years he moved to Dorset. He attended Merchant Taylor's School in London and then, after a brief spell at the Royal Veterinary College, he began his journalistic and broadcasting career. During the Second World War he joined the Royal Artillery, then the Royal Tank Regiment. His experience as a broadcaster led to his joining the staff of General Montgomery, where he played an active role in setting up a broadcasting service to allied forces. By the time he left the army in 1945 he had achieved the rank of Major. After the war, during the 1950s, he became the Editor of Lilliput magazine and Picture Post. Perhaps owing something to his upbringing on a farm, Hargreaves had a great passion for the countryside, and was active in the National Farmers Union. 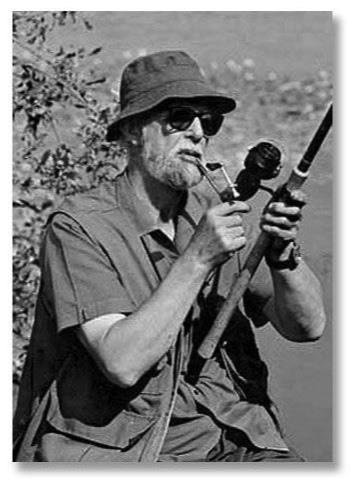 He was also a passionate angler, and his only angling book, Fishing for a Year, first published in 1951, made clear his commitment to fishing for pleasure rather than for sport. He was a great believer in the all-round angler. In 1959 he joined Southern Television and this was where his weekly series Out of Town was broadcast from 1963 to 1981. Other programmes or series in which he was involved include Gone Fishing, Country Boy and Old Country, Farm Progress and House Party. Jack died on 15th March, 1994. A biography of Jack Hargreaves was written by Paul Peacock in 2006.